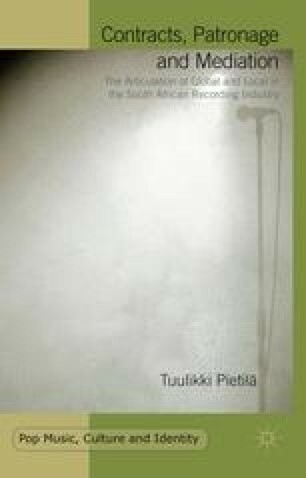 The recording industry representatives describe the South African music market as ‘highly segmented’. In practice this is seen in the way record labels, distribution networks, radio stations and programs, live music events and even wholesalers and retailers tend to focus on certain genres and audiences. This chapter explores the terms applied by the recording industry people for describing and discussing the segmented market. As with the other material in this book, my interview material comes from two main time periods, that is, from the mid-2000s on the one hand, and from the years 2011–2013 on the other. Even though there are some artists that cross over to different audiences, and their number has probably increased between these two time periods, the perception of the music market as being very segmented has remained. The market challenges lie in the wide diversity of the different population groups in the purchasing power levels, musical taste, music format use, as well as their geographical locations and access to and means of transportation. In addition to the ways of depicting the market, this chapter probes the record companies’ strategies for reaching out to the different black market segments. Furthermore, it explores the decreased sales through the general figures given by the interviewees. The declining physical format sales have put further pressure on the companies to invent new market strategies.